Striker Andrew Dalhouse’s Shoreham departure has been confirmed, with his now former manager Sammy Donnelly describing him as a ‘big fish in a little pond’. Frontman Dalhouse, who has made the move to division-higher Haywards Heath Town, had scored 11 goals in all competitions for Mussels so far this season but Donnelly says he’s not hung up over the departing striker, suggesting that he was finding life difficult at the SCFL Premier Division side. The move has coincidentally provided Shoreham with an upturn in form as the Mussels won for the second game in succession on Saturday, having not tasted victory in their previous 12 matches. Coming up against rock-bottom Eastbourne United, Shoreham had to work hard but came away with a 2-1 victory to take all three points. Scott Kirkwood opened the scoring for the visitors from the spot before a great individual goal from Tom Fraiser doubled the lead before the break. 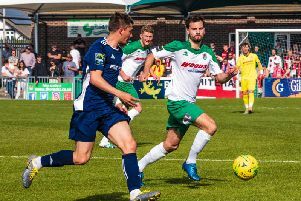 Mussels manager Donnelly was full of praise for his side’s defensive display as they overcame waves of United pressure and despite conceding early in the second half from a penalty, the match finished 2-1 to visiting Shoreham. Donnelly remained upbeat despite the loss of leading scorer Dalhouse, revealing said he’s not worried about a potential gap in the side. He explained: “What happened is that he (Dalhouse) found it a bit difficult, he was a big fish in small pond so he was finding life a bit difficult. I think it was best, he wanted to play at a higher level. Shoreham are without a game over the weekend before they host division-higher Three Bridges in a Sussex Senior Cup second round clash on Tuesday. With Donnelly saying there aren’t many differences between the two sides, despite being a league apart. SHOREHAM: Broadbent; Firman (Lalwani, 73), Proto-Gates, Kirkwood Bromage, J Tuck, Watts, Rhodie, Coulter-Wallis, Kirkwood, S Tuck. Subs: Mutungi, Lalwani, Bunker, Kamara, Kirk-Patrick.